Dutch yard Damen’s 55.5 metre superyacht support vessel Power Play has been delivered after successfully completing sea trials. 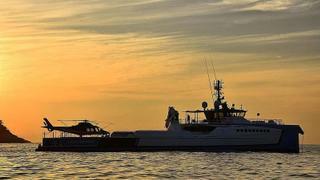 The vessel received its debut at the Monaco Yacht Show where it hosted the Damen and Amels party. The yard also revealed that construction is already underway on the seventh hull in the YS5009 series for a fast delivery in summer 2019. The vessel is currently for sale. Power Play's delivery follows her sea trials earlier in the summer which, the yard said, demonstrated the vessel's carrying capability. The vessel comfortably carried a 15 metre Damen Interceptor on the aft deck. With this load on board, the yard said that the 240 square metre deck and 12-tonne deck crane have ample room for more tenders, toys and submersibles. They also revealed that the vessel's top speed is 20 knots on the open water. She is the sixth YS5009 design from the yard. Previous examples include Ad-Vantage, Axis and Shadow. Mark Vermeulen, product director at Damen, previously said, “It’s inspiring to see how a new generation of yacht owners is driving this market. 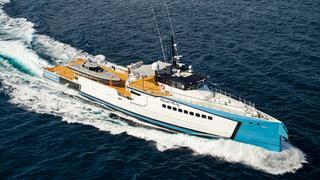 It’s very dynamic; it’s not the conventional thinking about luxury yachting. Our clients have fantastic ideas for diving, aircraft, luxury toys and serious boats. New features that set Power Play apart from her sisterships include a 50 square metre aft adventure centre that can easily double up as a dive store or a superyacht beach club. As with Shadow, Power Play offers on board accommodation for up to six guests split across three cabins — meaning that this is not just a crew vessel; owners can choose to have a short trip away from the mothership and enjoy the panoramic views from the main deck lounge or the sundeck. Power Play’s crew quarters are large enough for an operational crew of seven people and four further staff, such as pilots, security guards or local guides.